Simon asks: Who invented the Konami code? The Konami Code, also known as the Konami Command and sometimes the Contra Command is among the most enduring Easter eggs in video game history. For those of you who aren’t familiar, there are a number of video games released by Konami over the years in which entering up, up, down, down, left, right, left, right, B, A will result in the player being granted a host of power-ups or a bonus of some kind, depending on the game. While the code itself was initially featured in the 1986 Famicom (“Family Computer”, better known the world over as the Nintendo Entertainment System) port of Gradius, it is best known for its appearance in the 1988 NES port of Contra, in which it granted the player 30 additional lives. So who invented the Konami Code and why was it put in the game? 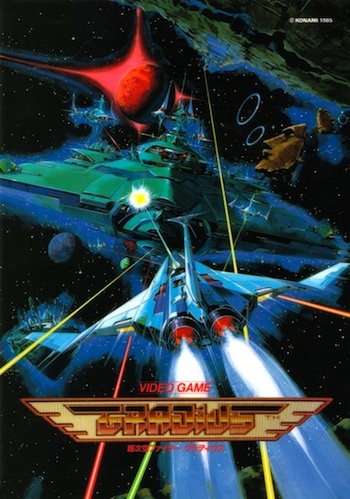 When Gradius was being ported to the NES, the guy in charge of developing and testing it, Kazuhisa Hashimoto, wasn’t very good at the game. This was a problem because part of his job included playing all the way through it to make sure there were no bugs or errors. To make beating the game easier, Hashimoto inserted a code that would grant him a full arsenal of power-ups. After he finished testing the game, Hashimoto forgot to remove the code before clearing it for release and the game went into production with the code still lingering in the game’s program. Hashimoto’s fellow developers at Konami liked his idea for a code that made games easier to complete when testing them out, and similarly began inserting them into other games they were working on to make their jobs easier. Exactly how the Gradius power up code became known to general gamers isn’t clear. But when it did, knowledge of it quickly spread via word of mouth, inspiring Konami developers to put the same code in the NES port of Contra to serve as an Easter egg of sorts for gamers who played Gradius and Gradius 2 (the latter of which also contained the same cheat code). Of course, as anyone who’s played Contra will tell you, completing the game without the Konami Code is difficult, if not nigh-on impossible without superhuman reflexes, perhaps also inspiring the developers to have mercy on gamers by keeping the code in. The code would later become synonymous with Contra thanks to massive coverage from gaming publications like Nintendo Power, who famously revealed its existence to thousands of young gamers in their first ever issue in 1988. Due to the code’s massive popularity with gamers, Konami decided to implement it in virtually all subsequent sequels to both Gradius and Contra while also inserting it into many of their other titles, because why not? Since then, numerous other game makers have used the same code (appearing in over 200 video games to date), and it has also spread to other forms of media, including being featured in songs, TV shows, movies, and on various websites, such as BuzzFeed. The founder of Konami, Kagemasa Kozuki, started a version of the company originally as a jukebox rental and repair business in 1969. Four years later, he switched gears and had his company start making “amusement machines”, with their first arcade machine not being released for another four years after that, in 1978.
Who ever wrote this COME to my SHOW PLEASE!